The Deadman didn't take kindly to Roman Reigns' threats. Wrestlemania is less than a month away, which always means one thing - the return of The Deadman. The Undertaker made his grand return on Raw last night, interrupting Braun Strowman's threats towards Roman Reigns. As an apparent sign of respect, Strowman nodded and walked away when The Undertaker stepped into the ring. On the other hand, Roman Reigns had no reverence for the 51 year old WWE veteran, telling him "this is my yard now." The Grim Reaper's response was, well, not very verbose. Instead, he stared at the Wrestlemania sign in the stadium and then chokeslammed Reigns before adjusting his jacket and leaving the ring. We'd say that sends a pretty clear message. 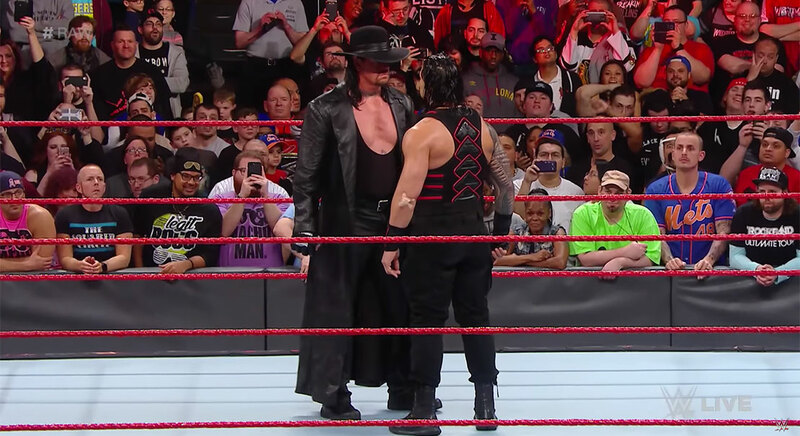 While it has not been officially confirmed, Reigns' confrontation with Taker is most likely setting up a clash between the two Superstars at Wrestlemania 33. The Undertaker is a Wrestlemania legend, with a streak of 21 wins until finally losing to Brock Lesnar in 2014. He has since recovered from that devastating loss by beating both Bray Wyatt and Shane McMahon in subsequent years. Wrestlemania 33 airs live from Orlando on April 2, and rest assured when there's a Wrestlemania, there's an Undertaker.